Order your M Audio Keystation Mini 32 MK3 Keyboard Controller from AMS and enjoy Fast & Free Shipping. Get the Best Deal with our Lowest Price Guarantee & Great Customer Service! The Keystation Mini 32 MK3 controller is a great addition to your creative process when making music on your Mac or PC. Featuring 32 low-profile, velocity-sensitive mini keys, the Keystation Mini 32 MK3 includes software that will inspire you to share your music with the world. 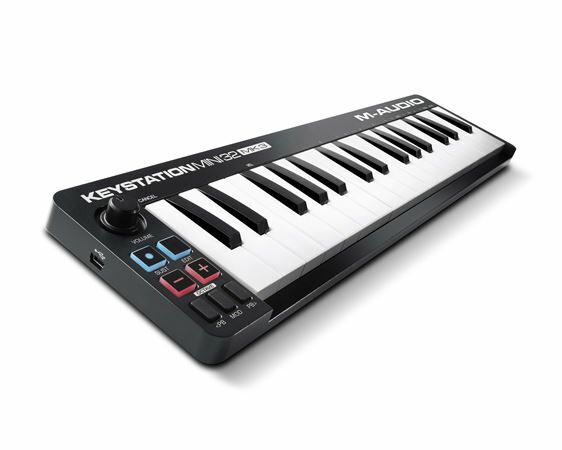 The world’s best-selling keyboard controllers: The Keystation Series from M-Audio. Whether you’re a seasoned pro looking for just the right controller when you’re on the go or you’re looking to get started with the right mini USB MIDI controller, the Keystation Mini 32 MK3 is for you! It’s a simple, powerful MIDI controller designed for sequencing music and playing virtual instruments on your Mac or PC. Keystation Mini 32 MK3 features 32 natural-feeling mini-size velocity-sensitive keys and comprehensive controls that expand the range of playable notes and enhance your expressive possibilities. Pro Tools | First M-Audio Edition is included with the Keystation Mini 32 MK3. Pro Tools is the industry standard for recording software and the teams at M-Audio and AVID have crafted a version of this terrific collection specifically tailored for M-Audio hardware. This amazing audio and MIDI recording software helps inspire any artist, traveling musician or singer-songwriter to create, record and share all their ideas across the world at any time.